Have a Taurus birthday and you need to know your rising sign? People with a Taurus birthday will find their rising signs here. Locate the date you were born. 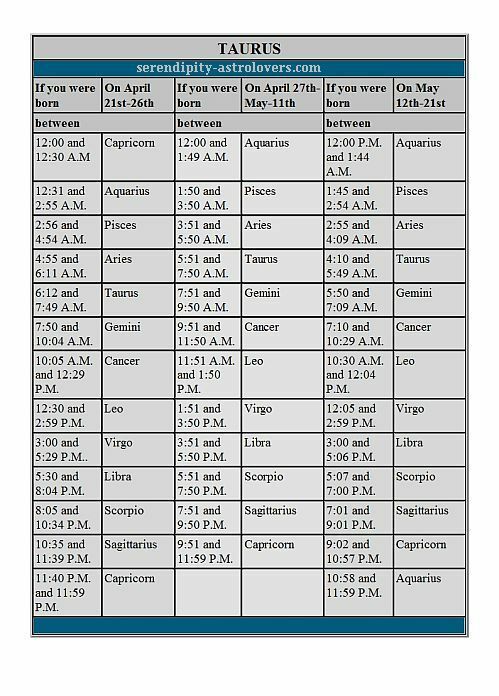 To the right of that column look up the nearest hour/minute to the time you were born that is before your birth time not after it. The zodiac sign noted in the box next to it is your rising sign. Some people, for whatever reason will not have their birth time available to them. What they should do is get a rectification birth chart drawn. Any good astrologer will be able to do that. An Astrologer would just take note of the big events in the persons life and this will help to determine what the ascendant sign is. You may be thinking that the other rising sign tables you have seen say different. You may find that these rising signs differ from what your birth chart or other astrology calculators say, there may be reasons for that. You have read on our pages that each sign corresponds to 30 degrees on the zodiac circle. You should also know that because of the Earth's angle the signs of the zodiac don't rise in the same amount of time. There are faster and slower moving ascendants. If you were born in the Southern Hemisphere your zodiac sign has a (fast=short ascension). If you were born in the Northern Hemisphere your specific zodiac sign has a (slow=long ascension). This rising sign table will work for any year. You should use a correct birth time. Failing that, use your best guess.